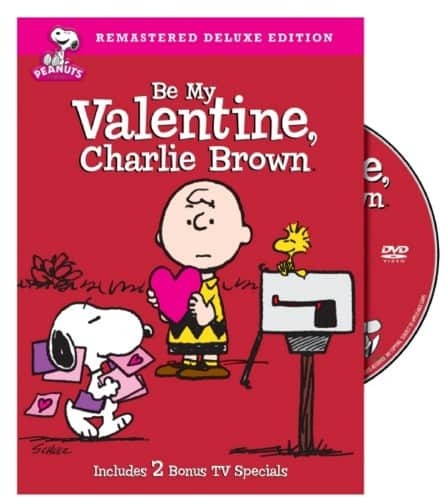 The Be My Valentine, Charlie Brown (Remastered Deluxe Edition) is on sale for $10 at Amazon right now. That's 50% off the list price of $19.97! Skip the chocolates this holiday…instead, grab a handful of Peanuts! Re-mastered with an updated look that still maintains the integrity and feel of a true Peanut's classic, Be My Valentine, Charlie Brown is packaged with two additional episodes and a bonus featurette making it a truly special offering. The Peanuts gang brings sweetness to matters of the heart. Will Schroeder ever notice Lucy? Will Linus find a Valentine gift for his favorite teacher? What about Charlie Brown? Aside from his continual fear of approaching the Little Red-Haired Girl, will he ever be confident enough to connect with that football? Whether you are a Peanuts fan or not, the affection and nostalgia the gang offers with Be My Valentine, Charlie Brown; bonus episodes It's Your First Kiss, Charlie Brown and You're in Love, Charlie Brown, and the special documentary featurette, Unlucky in Love: An Unrequited Love Story will warm you like Linus's blanket. Be My Valentine, Charlie Brown originally aired on January 28th, 1975 and was nominated for an Emmy Award. It was later re-mastered in 2008.